Nail art is the trend of today’s fashion world and it has been predicted that nail art will dominate the manicure world. But nail art has gone way ahead and we have seen a whole new dimension of the fashion trend. We now have 3D printed nail art which has received a lot of acceptance among girls. The material used for printing the 3D nails is something different and is a smooth texture with many colors, designs and textures. This different style of nails has appealed many customers. This 3D printed nails are very strong, flexible and are long lasting. The printing is quite affordable for the 10 nails. After the printing, the user can see some of the amazing and unusual design one can ever think of. Girls can have legos printed on their nails or couture claws printed on their nails. Even insane designs can be printed on the nails for some unusual scary designs. The colors can be matte if the user wants or nails inspired from the Disney villainess can be made. Metallic’s textures can be printed in black, bronze, steel and gold color for some unusual lovers. Legos can be printed in Raspberry or blue but the user should not eat them. Roman numerals can be printed on the nails and the 3D printing similar to ice can also be made which looks like glass. This 3D printing has emerged exactly when we all thought that nail art was becoming extinct from the fashion world. 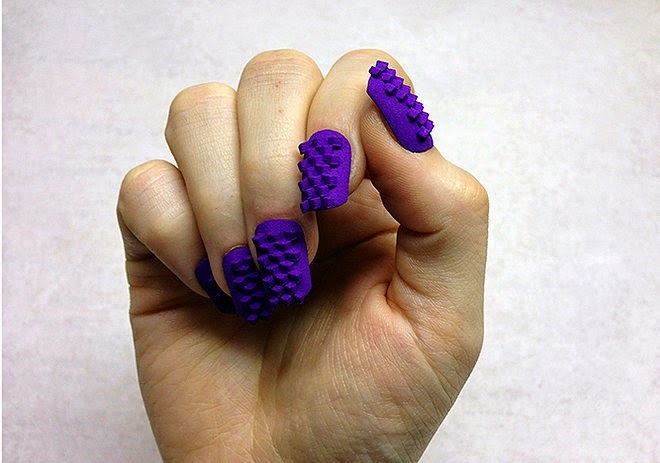 These 3D printed nails give a very edgy and artistic look to any outfit. The material used for the 3D printing is nylon plastic which gives this nails a smooth or a grainy texture as per the requirement of the clients. This nails are cooler than the nail art and are definitely worth trying once.